Solis 26 Compact Tractor (26HP with industrial tyres). 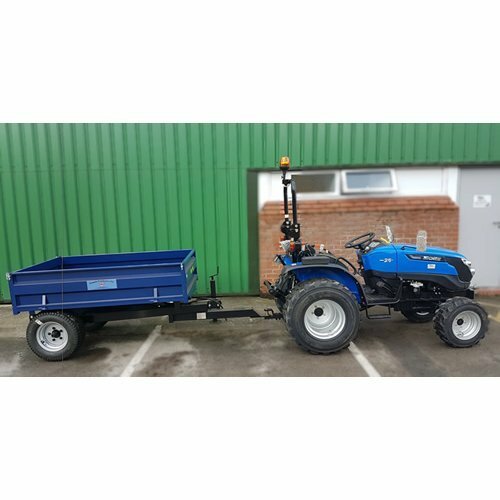 This compact tractor comes with a 1.5 Ton Tipping Trailer. Ideal for horse manure & soil. PLEASE NOTE IMAGES ARE FOR ILLUSTRATIVE PURPOSES - TYRES DEPICTED CAN VARY. PLEASE NOTE SOME ATTACHMENTS MAY BE DISPLAYED THAT ARE NOT INCLUDED IN THE PRICE. Walk round any farm show and you’ll see the familiar tractor marques like John Deere, New Holland, Deutz, Zetor and so on. But, increasingly, new names from Korea and India are heading for the UK too, with attractive price tags and increasingly sophisticated kit and build quality. Indian maker Solis has been in Europe for three years with its Sonalinka brand and has sold about 1,000 tractors in that time. Sonalika is an Indian tractor company based in the Punjab region in the north of the country and it has some pretty credible sales figures. Annual tractor production totals 90,000 units, which are exported across the world and the maker also produces its own engines, transmissions and drivelines. Despite making all of the components itself the manufacturer still claims to carry considerable pedigree. In the past it has produced Renault, and later Claas, tractors for the Indian market and works closely with Japanese engine maker Yanmar on product development. The Solis 26HP Compact Tractor is available with heavy duty industrial tyres, turf tyres or agricultural tyres. If you are looking for a small compact tractor with attachments, look no further than the Solis 26.